English Marano merchant and shipper; born at Fundăo, Portugal, about 1620. It is probable that he was one of the Neo-Christians who attempted to reestablish the Spanish dominion in 1641 (Kayserling, "Geschichte der Juden in Portugal," p. 307). He settled in London and was connected with the West-Indian trade. In 1656, during the war between England and Spain, two of his ships, "The Two Brothers" and "The Tobias," were seized and he himself was arrested on the ground that he was a Spaniard. 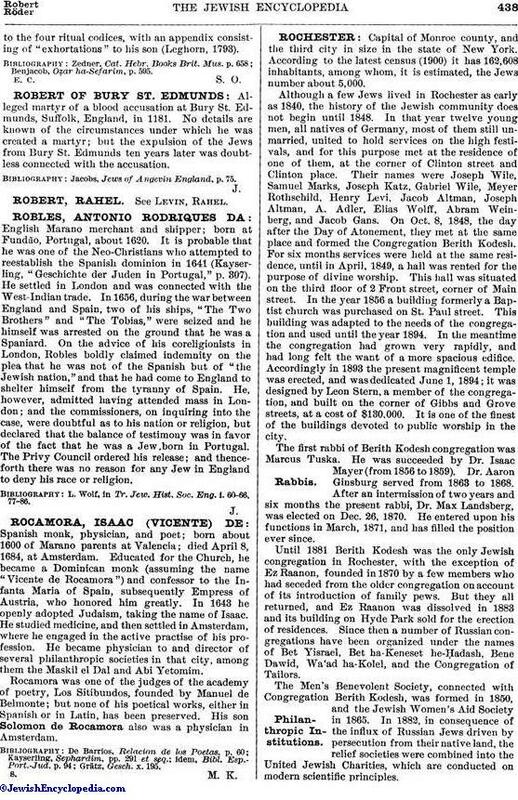 On the advice of his coreligionists in London, Robles boldly claimed indemnity on the plea that he was not of the Spanish but of "the Jewish nation," and that he had come to England to shelter himself from the tyranny of Spain. He, however, admitted having attended mass in London; and the commissioners, on inquiring into the case, were doubtful as to his nation or religion, but declared that the balance of testimony was in favor of the fact that he was a Jew born in Portugal. The Privy Council ordered his release; and thenceforth there was no reason for any Jew in England to deny his race or religion. L. Wolf, in Tr. Jew. Hist. Soc. Eng. i. 60-66, 77-86.